The variables which determine the international dimensions of Israel's policies are heavily influenced by changes in domestic demand and supply. As this list of variables continues to grow, Israel's efforts to ensure its portion of its internationally-shared water resources need to be adjusted within the context of its geo-strategic interests and positions, its international commitments and the growing global concern with water issues. 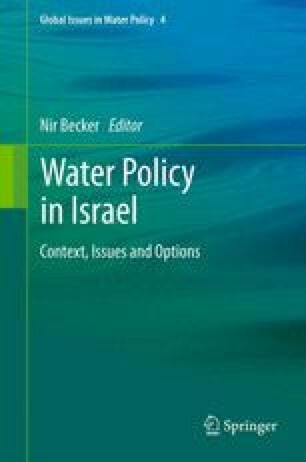 This chapter highlights the main characteristics of Israel's foreign policies in the water sector, how they have evolved, and presents conclusions which point to possible future trends. Barghouthi, I. (2004 May 5). Statement before the house (United States House of Representatives) Committee on International Relations. http://wwwa.house.gov/international_relations. International Water Law Project (2001). http://www.internationalwaterlaw.org/documents/regionaldocs/israel-palest-jwc1.html. Israel Hydrology Service Report on the Development of the Water Resources Until Autumn 2009. August 22, 2011 (Hebrew). http://www.water.gov.il/Hebrew/ProfessionalInfoAndData/Data-Hidrologeime/2009/skira.pdf. Israel Water Sector Master Plan – Policy paper – Approved by the Government Council for Water and Sewerage on 4 July 2011 (Hebrew). http://www.water.gov.il/Hebrew/Planning-and-evelopment/Planning/MasterPlan/DocLib4/PolicyDocument-jul-2011.pdf. Mizrahi, S., Mehrez, A., & Naor, A. (2001). A two-level analysis of Israel’s strategy toward peace during the 1990s. Fairfax: George Mason University. www.gmu.edu/academic/pcs/MizMehNa81PCS.htm. Piskin, D. (2011, June 6). Reported in Jordan: The government intends to increase the purchase of water from Israel. Calcalist (Yediot Ahronot). http://www.calcalist.co.il/world/articles/0,7340,L-3520432,00.html. Prime Minister Benjamin Natanyahu (2011). http://www.pmo.gov.il/PMO/Communication/PMSpeaks/speechfriends070211.htm. Shamir, U. (2004). Statement before the house (United States House of Representatives) Committee on International Relations, May 5, http://wwwa.house.gov/international_relations. Union for the Mediterranean (UFM) (2012). UFM Gaza desalination project. http://www.ufmsecretariat.org. Wolf, A. (2001a). Transboundary freshwater dispute database (TFDD). Available at http://terra.geo.orst.edu/users/tfdd. Wolf, A. (2001b). Transboundary waters: sharing benefits, lessons learned. International conference on fresh water, Bonn. http://www.agnos-online.de/inwent1/images/pdfs/transboundary-waters.pdf.